The decision of where to eat the main meal of the day is a very important one for a food blogger on holiday. With two guides books and a list of recommended restaurants from the food tour yesterday, it shouldn’t be too difficult a task to accomplish. 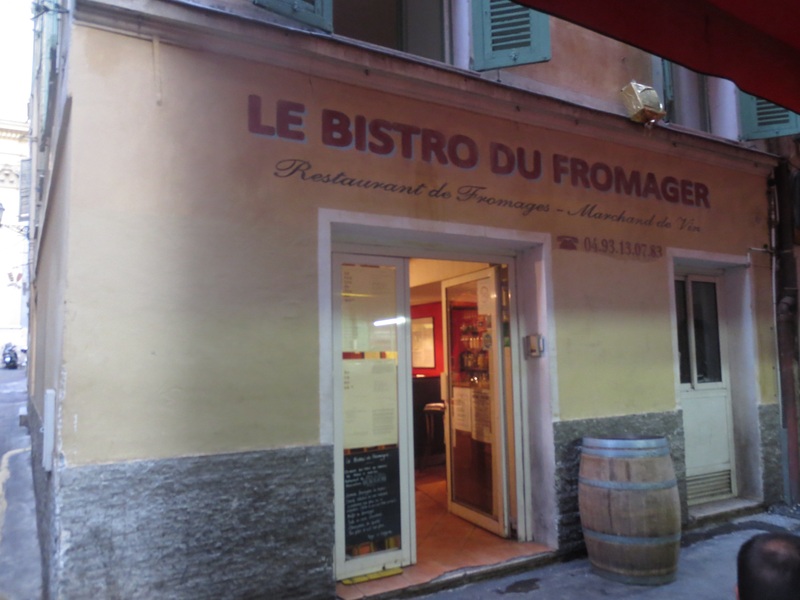 However, finding anywhere in the maze of narrow alleyways which is Vieux Nice is a big challenge in itself, then finding some of the restaurants are closed, or full, or the menu doesn’t appeal, complicates the issue. 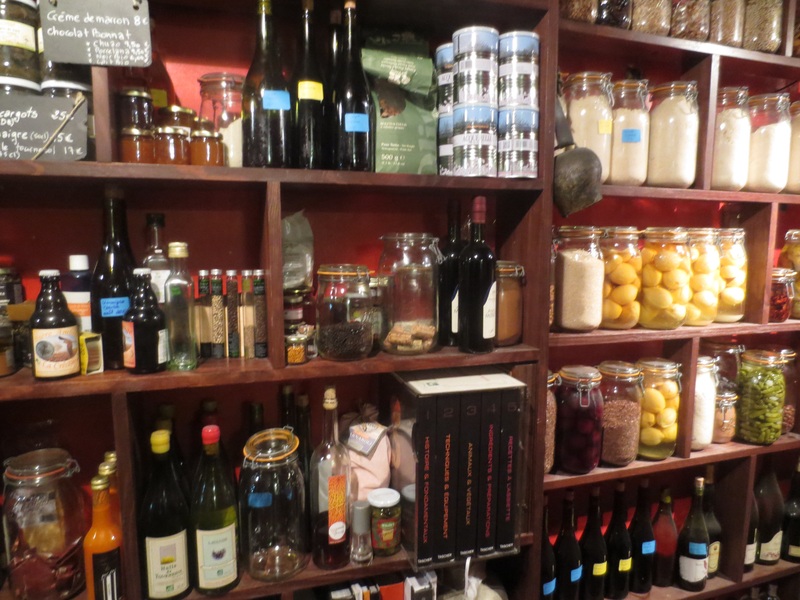 I wasn’t sure about Le Bistro du Fromager in Rue Benoit Bunico. As the name suggests, there’s a strong emphasis on cheese and much as I love cheese, generally, I like it pure and uncooked and on its own. 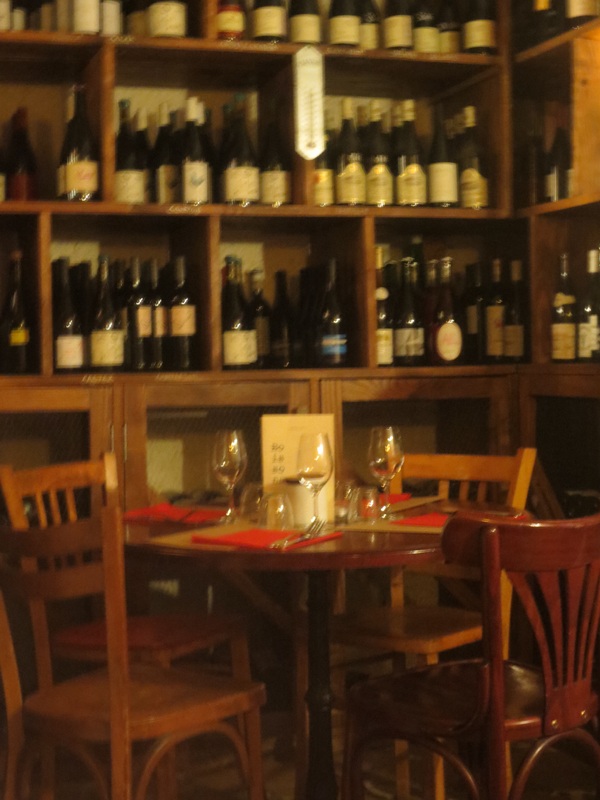 But Megan, our food tour guide yesterday, had said it was her favourite restaurant in Nice and I did like the look of the inside – more wine bar than restaurant. So that’s where I went. The tables are downstairs in a wine cellar. It’s quite dark but cosily done. The service was excellent: attentive, friendly and informed. I’d been trying to eat Nicoise food all the time but this was more ‘modern French’ with that Nicoise touch of Italian too, and of course lots of cheese dishes, like baked Camembert and fondue. 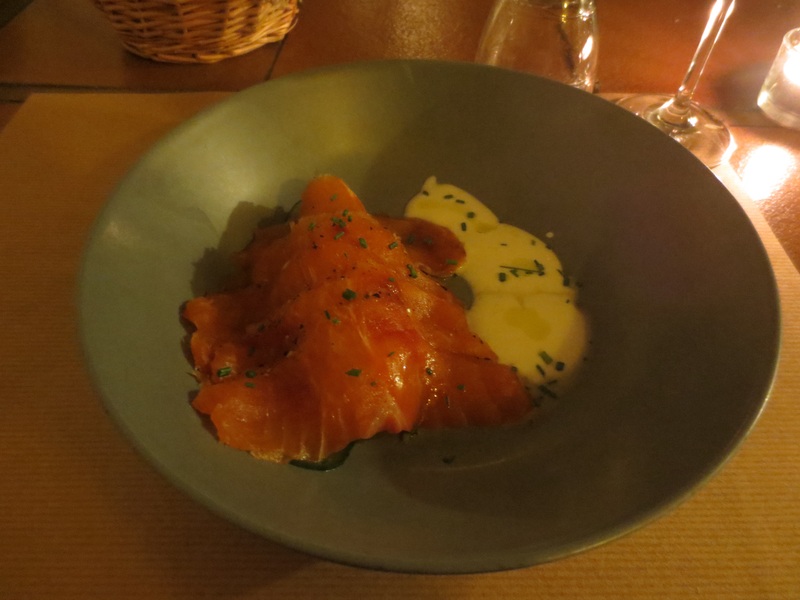 However, although the cheese dishes sounded good I went for the non-cheesy local home smoked sea trout with pickled cucumber and goats’ yogurt as a starter. I could see it was good as soon as it was put before me; in fact, it was superb. This is the kind of food that stops you in your tracks and you slow down to savour. This is the kind of food that makes eating on your own a bonus because you don’t have to make conversation, you don’t have to listen, you just have to eat and enjoy. If the fish was good, the homemade bread was magnificent. Now I’m a great lover of bread; I have a passion for good bread and I’m lucky enough to be able to buy wonderful bread where I live. 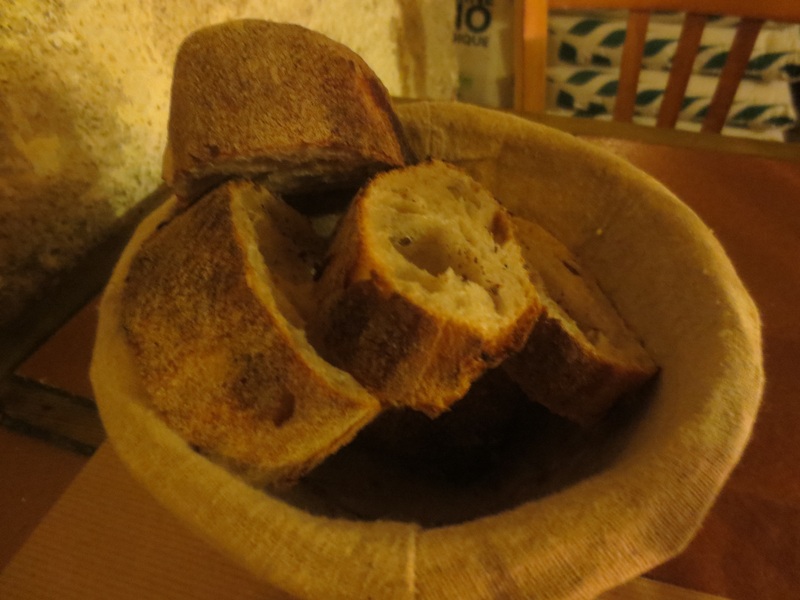 But this bread, with its dark flavourful crispy crust and gorgeous moist middle was some of the best bread I’ve ever eaten. They make it themselves. It took all my willpower not to eat the whole basket! But I had a main course to come so was restrained. 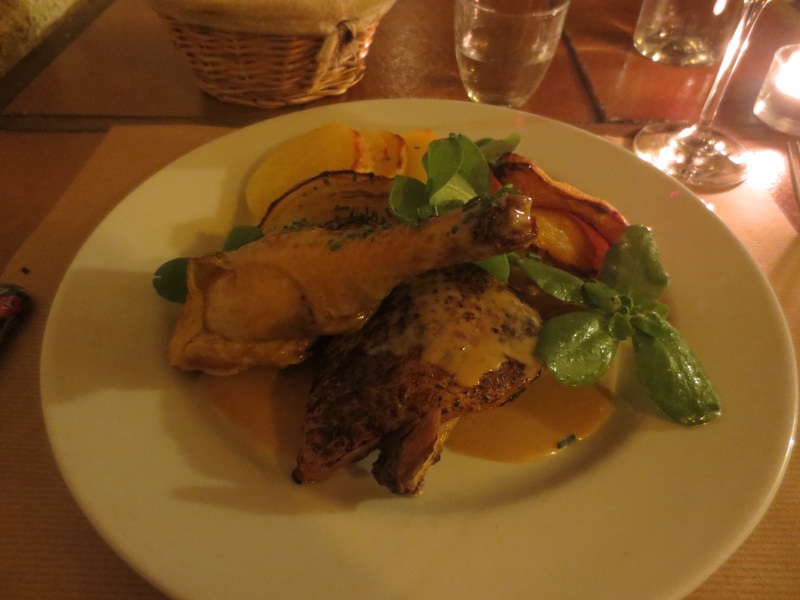 I’d chosen a Bresse chicken with a yellow wine sauce and roasted pumpkin, onion and potatoes. This was superb too: moist flavourful chicken (Bresse being some of France’s best), lovely caramelised vegetables and a gorgeous creamy sauce but not too rich. I drank red wine with the meal. I’m definitely a red wine person and having drunk local rose since arriving here, I felt it was time for red. Withdrawal symptoms were setting in. I was only planning to drink one glass (though ended up having two: they were quite small) and really, red is fine with fish; it’s the choice of which red wine that’s important. And I was having chicken too. The waiter suggested a local organic red from Cannes; nice and light to go with my food choices. I didn’t need a dessert. Of course I didn’t. But when a meal has been so good, how does one resist? 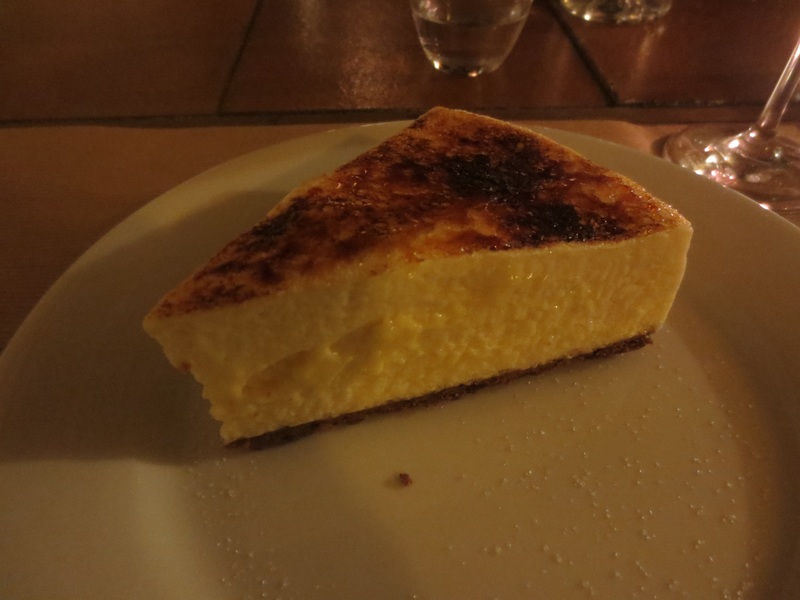 I chose Tarte au Citron, one of my very favourite desserts. It was such a large slice, my first thought was that I had made a mistake – I’d never finish it. But then I tasted it. Ambrosia! Gorgeous. Incredibly light; a perfect balance of sweetness and tart lemon. It was one of the most wonderful lemon tarts I’d ever had. I’m very fussy about them. I make a pretty mean one myself – an old senior Roux brothers very classic recipe. I don’t like a filling that’s really lemon curd. I like a wobbly softness to the filling; a sure touch of lemon flavour. This one was different – so light – but so very good. Later, as I was paying, I remarked on it and was told they make a lemon sabayon, thus the whisking had given it the lightness. 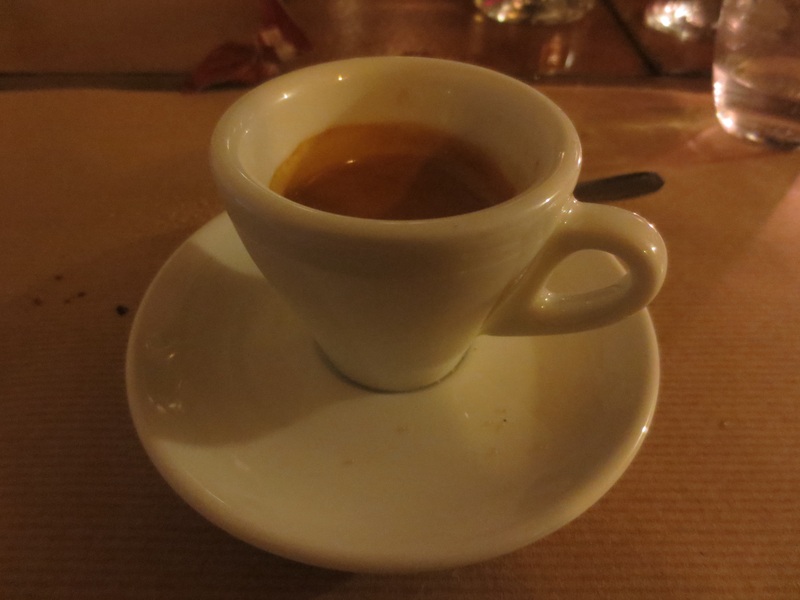 I do like a coffee at the end of a good meal and I like that when you order a coffee at the end of a meal in France that a long discussion doesn’t have to ensue about exactly how you’d like it. ‘Un cafe’ is understood; it’s basically an espresso. What else would you want but a nice short sharp shot of a good strong coffee to end a perfect meal? I had to go upstairs to pay and the ground floor entrance is both a reception and a shop. A large open hatch looks through to the kitchen. It’s a really great place. My bill was €53 (about £40). Not cheap – but there’s not really cheap in Nice – but by London standards excellent value for what I’d had. I’d enjoyed it so much, I booked a table for Friday – my last night. So, thanks to Megan who said it was her favourite restaurant in Nice; it’s mine too now. And perhaps on Friday I’ll try something with cheese. wow, the chicken looks gorgeous…me too I like sauces but not too rich .. great dinner! It was all excellent. Great find.